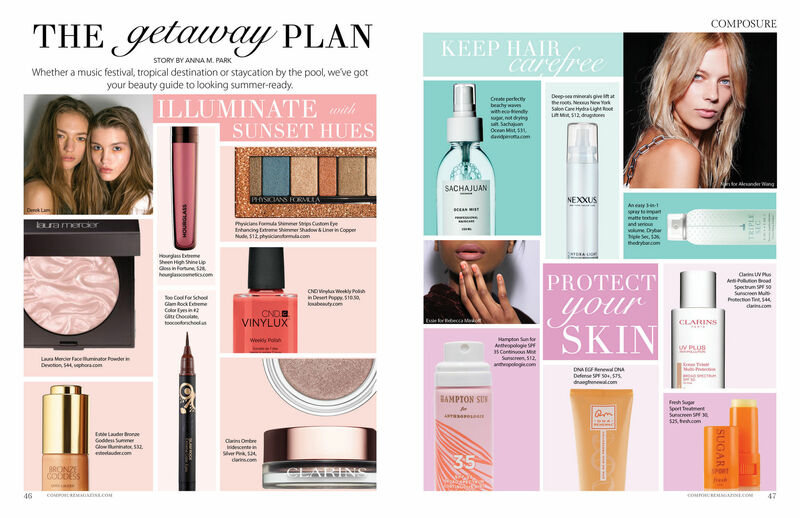 Whether a music festival, tropical destination or staycation by the pool, we’ve got your beauty guide to looking summer-ready. Read on for product reviews from my latest story for Composure Magazine‘s anniversary issue, gorgeously laid out by our talented editor-in-chief and creative director Jane Hong. Hourglass Extreme Sheen High Shine Lip Gloss in Fortune: Quite possibly my favorite lipgloss of the summer. 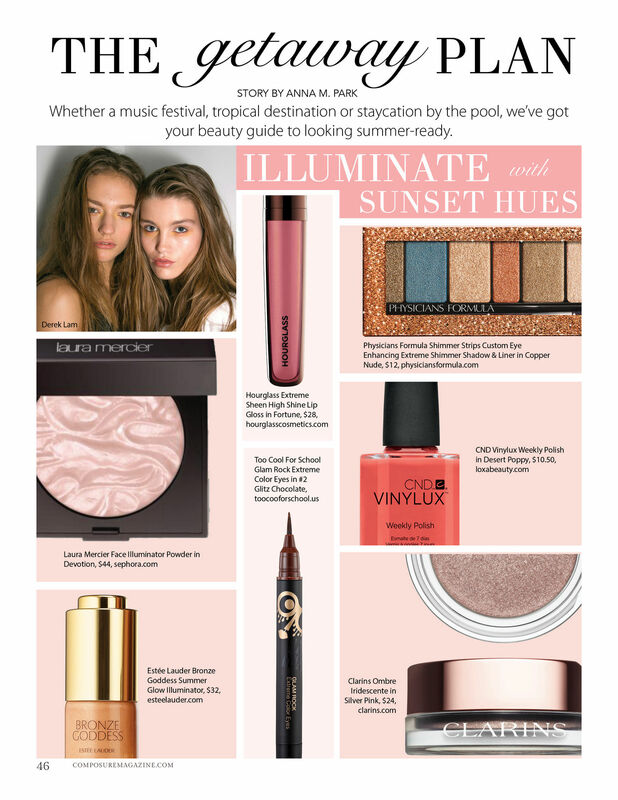 It’s got a hint of metallic sheen, like a sunset hitting your face on the beach. It’s super moisturizing, even for my perennially flaky, dry lips. And I can’t resist the rounded flat shape (as opposed to cylindrical like most lipglosses) — like an elegant pen. Laura Mercier Face Illuminator Powder in Devotion: It’s got a tiny bit of sparkle, so it may not be for you if you prefer your sheen more subtle. That being said, the texture and look of this highlighter (it looks like a piece of satin) is simply gorgeous. Clarins Ombre Iridescente in Silver Pink: I can’t wear shine on my upper lids anymore (it competes with the shine from my super-oily T-zone), but this beautifully easy-to-apply shadow (use your fingers and smudge on) is such a gorgeous hue, I’ll dab it on the inner corners of my eyes and even on the lower lid. CND Vinylux Weekly Polish: The color payoff of this nail polish line is always impressive, and I love that this polish lasts and lasts (especially if you use CND’s top coat, which “cures” in the sunlight), perfect for a lazy nail person like me. Sachajuan Ocean Mist: With a year’s worth of highlights ranging from ash to honey to caramel in my hair, I don’t need anything else drying it out, and my beloved salt sprays can dry out moisture-starved hair. Thankfully, this texturizing spray uses eco-friendly sugar, and creates perfectly beachy waves. Drybar Triple Sec: I pretty much love anything from Drybar’s hair line — it makes a lazy hair person like me look (almost) like I actually have some hair skills. Think of their Triple Sec as a dry shampoo-meets-texturizer-meets-volumizer. Clarins UV Plus Anti-Pollution Sunscreen Multi-Protection Tint: Broad-spectrum (meaning it protects against UVB and UVA rays, with its main ingredient titanium dioxide), SPF 50 (the highest the FDA allows), tinted from light to deep so you don’t get that chalky white look no matter your skin tone, and a super lightweight feel. Plus they added a bunch of antioxidants and anti-pollutant ingredients. Yes, it’s got alcohol in it, which probably accounts for its thin texture (and experts are divided on whether you should avoid alcohol in skin care). But other than that, really, the only way they can make this sunscreen better is if they turned it into a pill.